Russia's central bank finally raised its overnight rate to 7% (from 5.5%) to stabilize the ruble. Apparently there is only so much currency depreciation the central bank is willing to allow. Longer term rates response to the central bank action was muted, with the 10y yield rising just over 50bp for the day. 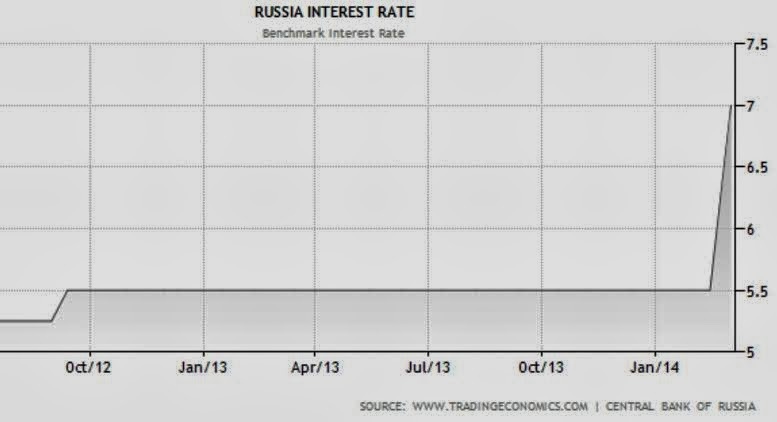 With Brent crude jumping 2% this morning, more hard currency will be flowing to Russia. The fiscal situation therefore is expected to be stable, reducing the risk on longer-term paper. The currency depreciation continues in spite of the rate hike. The ruble fell below 50 rubles per euro for the first time. With the ruble weakening (which should reduce imports) and oil prices higher (which will increase the value of exports), the nation's current account will improve. Putin's economic advisers will not be losing any sleep over the current geopolitical tensions.